Cat Post Hole Auger Details - Quasius Equipment, Inc. The optional post hole auger for the Caterpillar 226 skid steer loader utilizes the industry standard quick-attach mounting system. 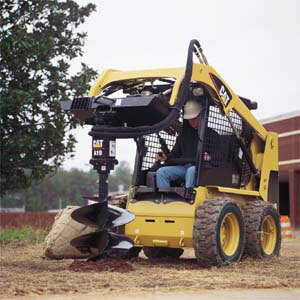 It features a high torque hydraulic motor capable of drilling 12", 18", or 24" diameter holes into the ground with minimal effort. Extensions are available for the augers which will give a maximum drilling depth of 5'. Both the auger and bucket can be used interchangeably on the job site so that you can place the removed dirt wherever you want it. Click Here to return to Cat Skid Steer Loader.